Sometimes fabric doesn’t seem to make sense when you see it as a sample swatch but once you see the finish in your home, everything falls into place. 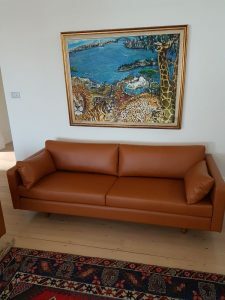 Upholstery needs an open mind to see the what the client is after. It’s not just picking a fabric, it’s your home, it’s love and it’s all the memories that will come. 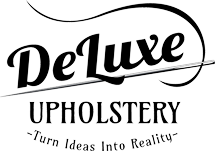 At De luxe Upholstery in Sydney we have the utmost patience in helping you build your home furniture no matter what you want. We recovered these 2 beauties in a Tan Ultimax Vinyl looks and feels exactly like leather not your typical vinyl and is strong and durable like leather. Re-padding of the foam in firm density, re stained the wooden legs in a walnut to match the material and home. Very pleased with this one.